Flux determines the total amount of light emitted by a light source in different directions within 1 second. 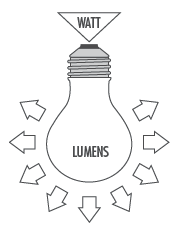 The unit of luminous flux is the lumen [lm]. The lumen is a unit which takes into account changes in the sensitivity of the human eye, which reaches the maximum during the day for the length of an electromagnetic wave (green) of 555nm, and at night for the electromagnetic wavelength (blue) of 507nm.